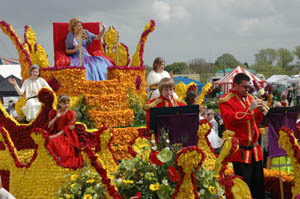 Caroline Kenyon, on behalf of the Spalding Flower Parade commissioned this short opening fanfare to be played at the 2011 event. My ebullient little piece borrows its title from the famous Italian glassware technique. Spalding's parade (an English "Rio"!) is indeed a thousand flowers (if not more! ), and its exuberance seemed to call for similarly sparkling, virtuosic music. The work was played by four trumpetters from the RAF, though (somewhat amusingly, perhaps) the powers-that-be refused to allow them to play it in uniform (...far too modern....! ).